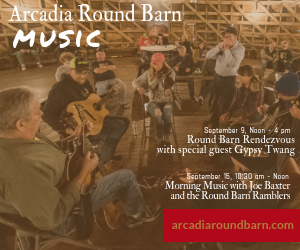 Arcadia– Rain or shine, the Arcadia Round Barn Rendevous will go on as planned Sunday, September 9, Noon – 4 pm, with special guest, Gypsy Twang. Find these melons and tomatoes at Josephine’s Cafe Saturday. The same can not be said for other activities this weekend. The drenching rain this week has forced the closure of The Arcadia Farmer’s Market on Saturday morning, September 8. 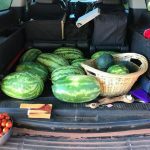 In Luther, Josephine’s Farmer’s Market will also not be open outside, however, John and Scherrie Pidcock will have watermelons and tomatoes for sale inside Josephine’s Cafe. The rain and muddy conditions are not stopping the Old Chicken Barn Vintage Sale in Jones on Saturday from opening. 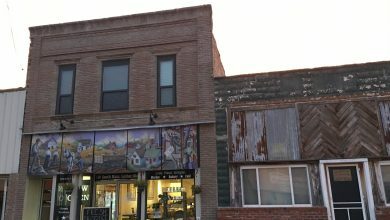 Several Luther area artists and vendors participate in that popular shopping event. Sunday’s Round Barn jam session starts at noon, and Gypsy Twang will play from 2 to 4 p.m. The Tulsa band is made up of Steve Huhn on upright bass, his wife Sarah Barker Huhn on guitar and vocals and John Williams on guitar, harmonica and vocals. 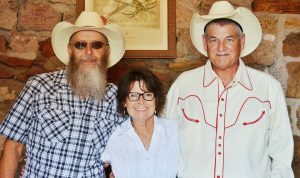 Gypsy Twang, now in its ninth year as a band, has played at the Woody Guthrie Festival, the Gypsy Café in Stillwater, the Skyline Festival and at Cain’s Ballroom in Tulsa. The Round Barn Rendezvous is held on the second Sunday of every month from noon to 4 p.m. 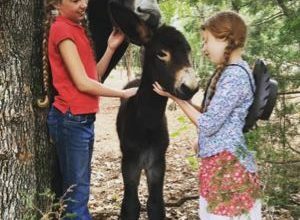 Admission is free, but donations are accepted for the maintenance of the Barn. The museum and gift shop are open daily from 10 a.m. to 5 p.m.